The Midland County Sheriff’s Office and the Texas Rangers are asking for your assistance with an investigation into the discovery of unidentified human remains. On August 1, 2013, the unidentified human remains were discovered near an oilfield location in Midland County approximately 10 miles south of Interstate 20 near FM 1213. The remains were determined to be a female most likely being White or Hispanic, 14-21 years old at the time of death and 59 to 67 inches tall. A DNA profile was developed and has been compared to several local missing persons as well as entered into the national database. Homicide is suspected. f anyone has any information about this crime, please call Crime Stoppers. You could earn a $2,500 cash reward if it leads to an arrest or case solved. You will remain anonymous because no caller ID is ever used. La Oficina del Alguacil del Condado de Midland y Los Rangers de Texas están solicitando su ayuda para investigar el descubrimiento de restos humanos no identificados. El primero de Agosto de 2013, los restos humanos no identificados de una mujer blanca, posiblemente hispana, fueron descubiertos cerca de una ubicación en un campo petrolífero en el condado de Midland, aproximadamente a 10 millas al sur de la Interestatal 20 cerca del camino FM 1213. Se determinó que los restos eran probablemente de una mujer entre 14 y 21 años de edad y 59 a 67 pulgadas de altura. Se desarrolló un perfil de ADN y se comparó con varias personas desaparecidas locales y se ingresó en la base de datos nacionales. Se sospecha de homicidio en este caso. Si usted fue testigo o tiene información sobre este crimen, se le urge llamar a Crime Stoppers de Midland al 694-TIPS. También puede dejar una pista en midlandcrimestoppers.com. Permanecerá anónimo porque nunca se utiliza identificador de llamadas. Ayúdenos a poner a estos ladrones tras las rejas donde pertenecen. <?xml:namespace prefix = "o" ns = "urn:schemas-microsoft-com:office:office" /> For 8 years now, a Midland family has waited for closure in the death of their son. 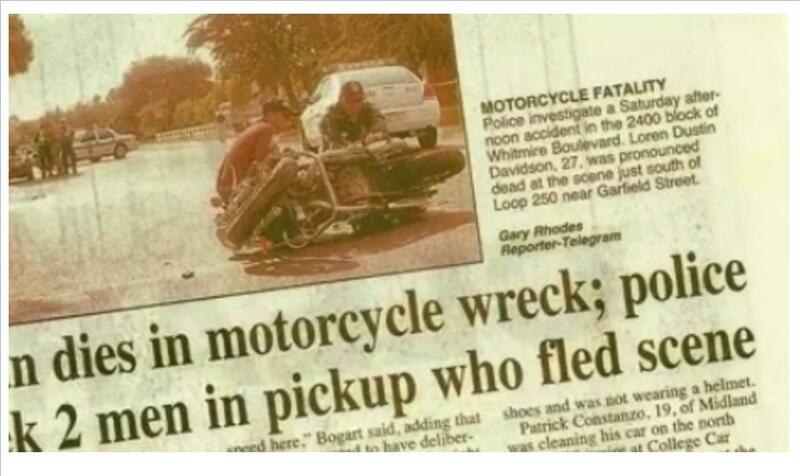 On September 12, 2007, Dustin Davidson was killed in a motorcycle crash that occurred at Whitmire & Garfield when the driver of a truck pulled out in front of him and Dustin couldn’t avoid the truck. Dustin landed in the street and died from his injuries. After stopping and asking how Dustin was doing, both men in the truck drove away. Midland Police Sergeant Jimmy Young advised that the investigator who worked the case spoke with witnesses who advised that it was a grey Chevrolet pickup with a partial license plate C-T-7. The two white males stopped to check the status of the victim and someone on the scene said he has massive head injuries and the two males drove off. No one has ever been arrested or charged, and each year it seems that they may never know who did this, but the family hasn’t given up. Dustin left behind a daughter who was very young at the time and is now a teenager. Her grandparents feel it is time that this case is solved for her and the rest of the family. If you have any information regarding this case and it leads to this cold case being solved, you will be eligible for a $2,500 cash reward. You will remain anonymous. Midland Crime Stoppers and the Midland County Sheriff`s Office need your help solving a Cold Case. If you are the first person to call with information that leads to an arrest, will be eligible for a $2,500 cash reward. So call Midland Crime Stoppers at 694-TIPS or 1-800-7LOCKUP or click on Help Solve This Crime. You will remain anonymous and no caller ID is ever used. Midland Crime Stoppers and the Midland Police Department need your help in solving a unsolved Homicide. On Tuesday October 6th at 6:42 a.m., a passing motorist came upon a Red 2007 Dodge Pickup on a cement embankment on the north service road of the 4300 block of West Wall and Midland Drive. The driver and lone occupant of the vehicle who was later identified as 45-year old James Jimmy Thomas was found slumped over the steering wheel. Thomas was covered in blood and unresponsive. Emergency medical personnel later confirmed that James Thomas was deceased. James Thomas used to frequent motels around the West Wall Street area and people knew him by his street name of “Sidewalk”. Evidence at the scene indicates that this case would be classified as a Homicide. If you are the first person to call with information that leads to the the arrest of the person or persons responsible it will be worth a $2,500 Cash Reward. So call Midland Crime Stoppers at 694-TIPS or 1-800-7LOCKUP. Or click on Help Solve This Crime. You will always remain anonymous and no caller ID is ever used. Midland Crime Stoppers and the Midland Country Sheriff`s office need your help in solving an Unsolved Homicide. On February 8, 2004, Midland County Sheriff`s deputies were dispatched to the Knights of Columbus meeting hall located at 4601 F M 1788 reference to a shooting. Upon arrival, a Hispanic male was laying in the parking lot with gunshot wounds. The male was identified as Ivanhoe Urias and he was transported to Midland Memorial Hospital and passed away at the hospital as a result of the gunshot wounds. The entire altercation took place in the parking lot with many witnesses. Many of these witnesses have been interviewed by investigators, but to date, none of them have given investigators anything solid to go on. Ivanhoe`s live ended just a few months short of his 26th birthday and it has been several years since the tragic incident that took his life. The fact that this crime has gone unsolved this long is unfortunate, but the time is now for those who know any information to tell their side of their story. Help bring resolution to this terrible crime. If your are the first person to call with information leading to the arrest of a a suspect in this unsolved homicide you will be eligible for a $2,500 cash reward. You will remain anonymous and no caller ID is ever used. 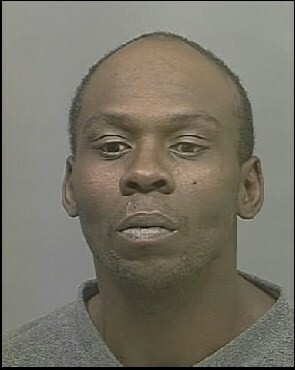 Midland Police are once again asking for the public`s help to find a man who has been missing. 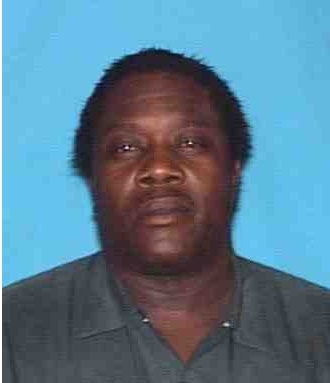 Jeffery Wayne Braziel B/M 38 years old 5`6 150 Black hair Brown eyes was last seen on Tuesday, February 28, 2006 in the area of Lee and Illinois. Jeffery is missing a front tooth and is mentally challenged. Help us find Jeffery. If you are the first person to call with information that helps investigators locate Jeffery, you will be eligible for a $2,500 cash reward. So call Midland Crime Stoppers at 694-TIPS or 1-800-7LOCKUP or click on Help Solve This Crime. You will always remain anonymous and no caller ID is ever used. On January 19, 1992, Manuel Galindo was admitted to the emergency room at Midland Memorial Hospital where he died due to multiple stab wounds in his upper torso. The investigation revealed that an argument began near the Dog House Lounge located in the 300 block of North Mineola between Galindo and his friends and several other Hispanic males. The argument continued and moved to the parking lot of Al`s Grocery which in 1992 was located at the corner of Tennessee Ave and Mineola Street. According to witnesses, Manuel was able to go to his home after the fight where he alerted relatives that he had been stabbed. There were several participants in this fight and in all the confusion a killer has managed to remain free and this homicide remains unsolved. Manuel Galindo was only 19 years old when he was murdered. If you are the first person to call with information that identifies the actor in this homicide and solves this cold case, it will be worth a $2,500 cash reward. So call Midland Crime Stoppers at 694-TIPS or 1-800-7LOCKUP. Or click on Help Solve This Crime. You will remain anonymous and no caller ID is ever used. 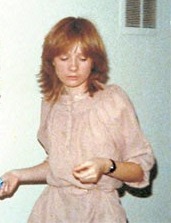 It was 28 years ago on February 2, 1980, that 19-year old Kristy Lynne Booth disappeared from the Dimensions Nightclub at 411 Airpark. Investigators exhausted all leads in the case and have yet to solve the crime. Kristy, was at the club partying with friends. She was discovered missing around 11:00pm. She had gone outside, for unknown reasons, and left her shoes and coat inside the club. The weather was cold and icy and it is surmised that she either left the club unwillingly or went outside with the intention of staying only a short time. Her friend, Ron Ferrengburg (now deceased) had borrowed her car. The vehicle, a 1977 white and maroon AMC Pacer, was found abandoned 1.6 miles south on State Highway 349 on February 4, 1980. The vehicle had been driven 268 miles after being repaired on the day of her disappearance. There has been no new information on the case for several years. The Midland Police Department refuses to close the case and request that anyone with any information on the case call Midland Crime Stoppers at 694-TIPS or 1-800-7LOCKUP or click on Help Solve This Crime. You may be eligible for a $2,500 cash reward. NO Caller ID is ever used and you will remain anonymous. 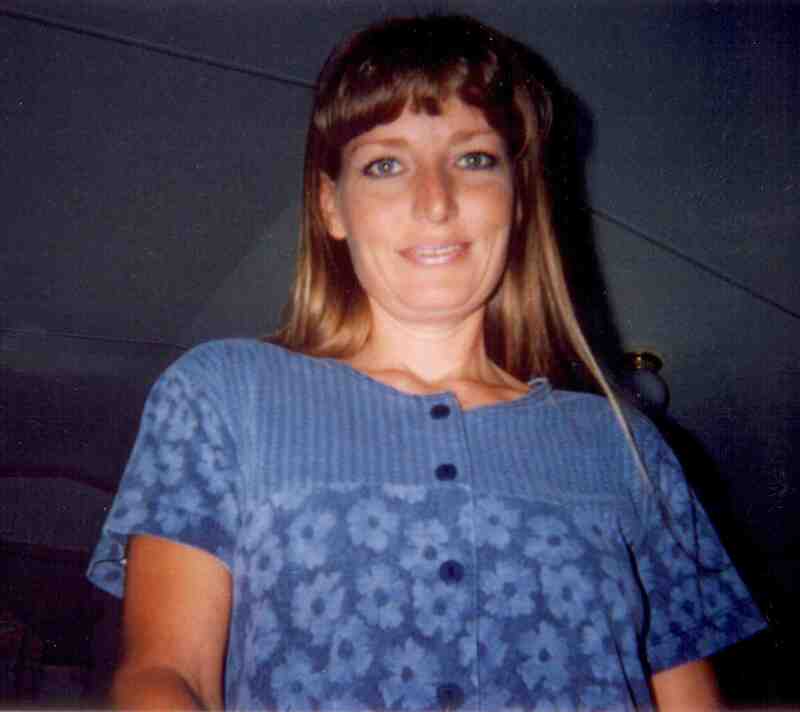 The Midland Police Department is requesting assistance from the public on a 25-year old unsolved homicide. On December 7, 1982, a relative found 53-year old Donald A. Allen in his Royal Crest Apartment at 4201 Andrews Hwy. He was partially dressed and had been stabbed approximately nine times in the chest, back and abdomen. There were no signs of forced entry and the evidence indicated that the assault began in the bedroom. Several Christmas packages had been unwrapped thus making robbery either the motive or an afterthought. The victim had been dead at least two days prior to the discovery. The victim lived alone and prior to his death had been employed at Carpet City. Mr. Allen was a quiet person who frequented area nightclubs and would occasionally entertain after hours with other bar patrons or acquaintances. Other apartment dwellers described an older model black pickup, either a Ford or Dodge, had been seen in the apartment parking lot a few days before the murder. The truck was described as early 1960`s model that had a rounded cab, large tires, loud mufflers, small mirrors and funny shaped fenders. The truck either had Texas tags or possibly a yellow license plate. The subject associated with the black truck was described as a white male, 28-32 years of age, over 6 foot tall, black hair and bushy eyebrows. The deceased and the unidentified subject were overheard having a loud conversation in the parking lot of the apartment complex. The unknown subject and pickup were last seen at the apartments on Saturday December 4, 1982. Anyone with information on this case may be eligible for a $2,500 cash reward. Please call Midland Crime Stoppers at 694-TIPS or 1-800-7LOCKUP or click on Help Solve This Crime. No caller ID is ever used and you will remain anonymous.